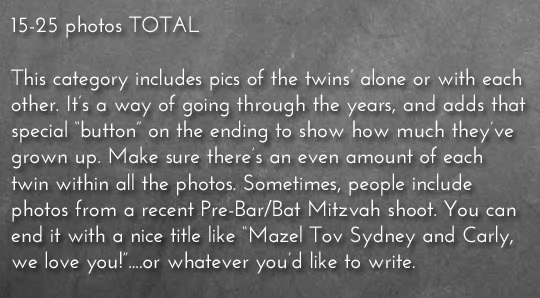 How do you organize a B’nai or B’not Mitzvah montage for a set of twins? Believe it or not, you can follow the same categories, and outline that you would for an individual girl or boy, everything is just doubled. 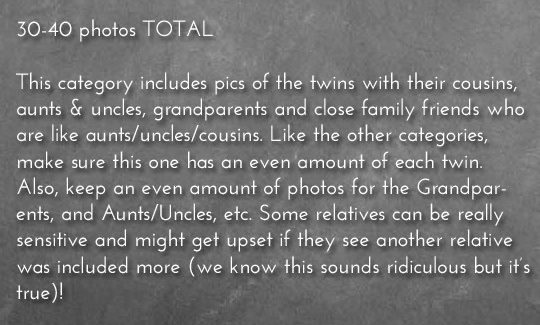 If you decide to go with categories (which we actually recommend), we’ve listed the appropriate folders to form on your desktop for making a 150 photo montage (8-10 minutes long). Here is a sample of a B’not Mitzvah which follows a category outline. It has other video clips interspersed between the categories (which is not required), but you can see what we mean. And Wa-La! There you have it. For more answers to your questions, and in depth guidelines on how to get started, contact the team at Storyteller today!